Finally no Christmas list would be complete without Santa Claus. In this case Santa Claus Losack whose birth was registered in Q1 1891 in the Holborn District of London. 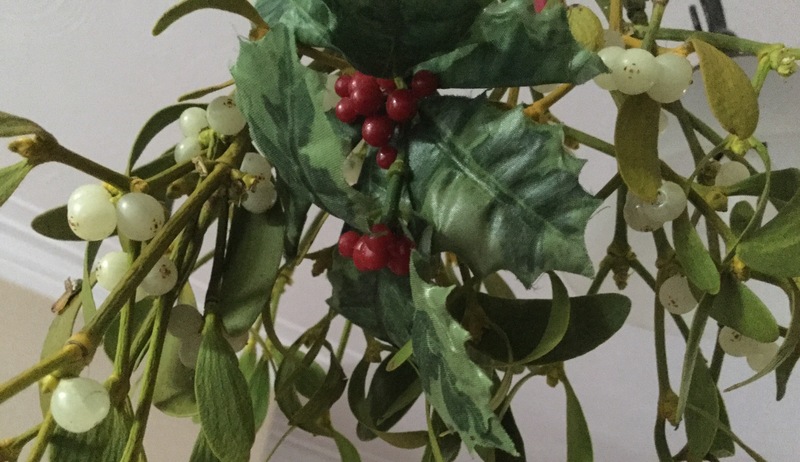 Many of our Christmas traditions originate from Victorian times, and this is when it really took off as the festival we recognise today. So it seems clear, with the dates in which the majority of birth registrations occured, that many of these babies were named with the time of year in mind. Anyway there’s only one thing I can end with saying to everyone: Mary Christmas, and there are many of them in the birth indexes. Another free resource for family historians. 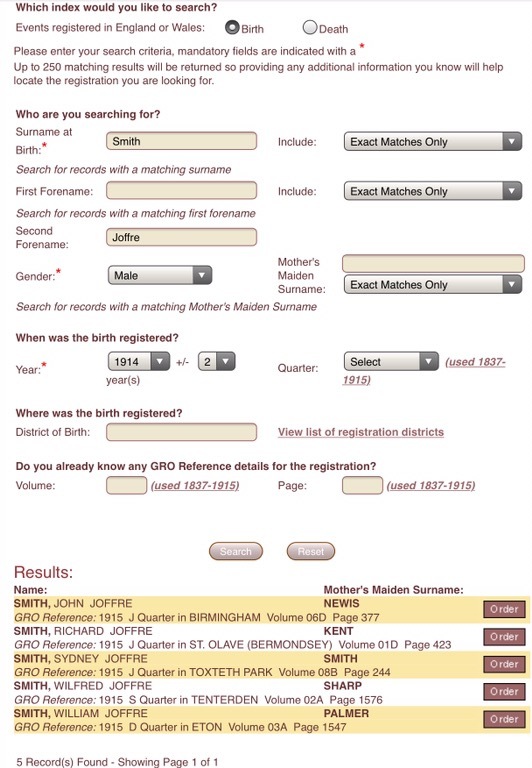 The GRO (England & Wales) have made available online a searchable index of births and deaths, via their website. All you need to do is have a registered GRO online certificate ordering account. This new index covers registered births from 1837-1915 and deaths from 1837-1957. The plan was to limit the index to births over 100 years old and deaths over 50. However the GRO state that completing digitisation “would require significant investment and there are no current plans to resume this work but we continue to monitor the scope for future opportunities to complete the digitisation of all birth, death and marriage records.” So, I suspect in this climate of government austerity, the completion of the death digitisation, the year-by-year roll out, and the digitisation of marriages won’t happen anytime soon. However they will update the index if there are errors and omissions, and they do have an error report form for these to be submitted to them. The GRO have a FAQ section on the website. This includes a guide about searching the indexes. So I won’t cover that aspect in this post. There is also a useful guide here. So what does this GRO online index add to the indexes already out their via FreeBMD and subscription sites like FindMyPast? Well for a start this is a brand new index and not a copy of an existing third party one from the microfiche indexes. Anyone doing family history will be familiar with the scenario – a search on two websites will not necessarily yield exactly the same results. So this provides an extra check with which to by-pass errors and find that illusive record. Crucially, as the GRO point out, this new index contains “additional data fields to those which are already available and this will assist family historians to identify the correct record.” Other indexes, because they are taken from the microfiche indexes, only include age at death from the March quarter of 1866 onwards; and for births the mother’s maiden name only features from the September quarter of 1911. This index is different. 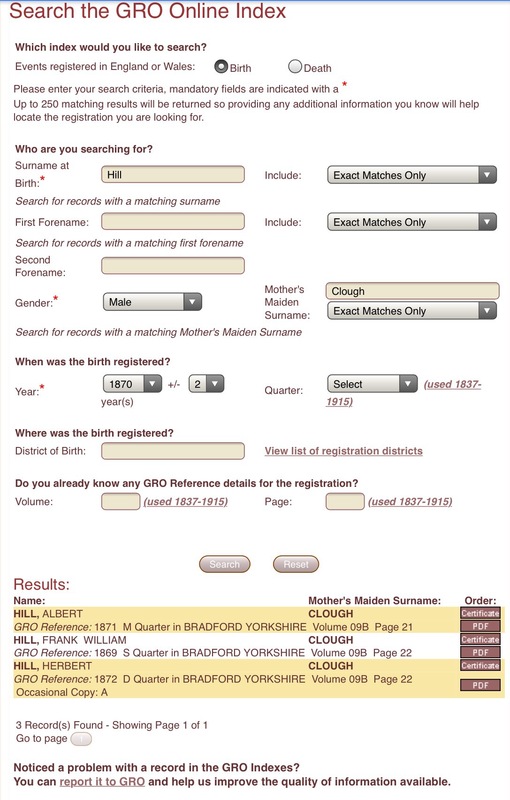 Because it is a new compilation, where possible the GRO have provided the mother’s maiden name right back to 1837; similarly an age for deaths is also included if it is on, or is legible on, the original entry. The convention for recording the age as 0 for infants under 12 months is continued though. As a result of this extra information I think I have narrowed the 1860s death of my 3x great grandfather to two possible certificates: Not the several of previous searches. At £9.25 a certificate this could make all the difference to me taking a gamble and ordering. Similarly the availability of the mother’s maiden name on the earlier birth entries enables pinpointing the correct entry far more straightforward. 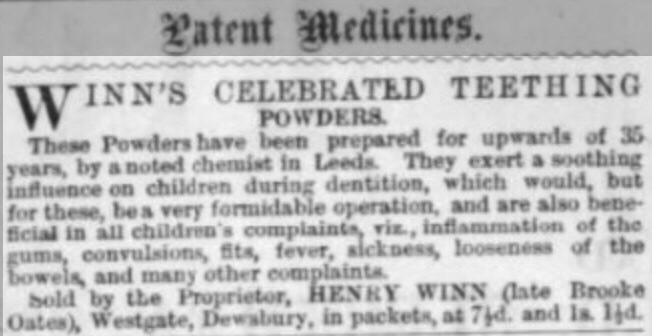 It also is a useful tool to discover hitherto unknown children of a marriage during the 1837-1911 period. Also whereas other indexes record middle names as initials for many years, the new GRO index gives them in full. In my post about names in World War 1 I didn’t include middle names as these were not identifiable in the FreeBMD indexes for that period. The use of initials on FreeBMD is explained here. However it is now possible to do a middle name search to a limited extent on the new GRO index irrespective of period, as the screenshot below illustrates. I did a search for a middle name of “Joffre” for 1914 +/- 2 years. With other indexes this isn’t possible, they just show the middle name by initial for these years, in this example “J”. Although it’s not a solution to calculating a total number as you can’t search without a surname, this facility might aid the correct pinpointing of an entry. not having a county-wide search functionality. It’s either everything, a volume number, which does not equate exactly to all the districts within a county (thanks to gwinowan for the tip) or a specific registration district. And finally one anomaly. In my post about tricky names I indicated how my 3x great grandparents changed their minds about the name they registered my 2x great grandmother under. She was originally registered as Emma Clough but, as was permissible, they subsequently amended her name to Kesia (she was known as Kezia(h), so even more spelling variants). This is shown on the original birth certificate and GRO copy. When searching on the microfiche indexes she is found under Kesia Clough. In the new GRO ones she’s down as Emma. The same applies to my great grandfather – originally registered as Herbert Hill, but amended to John Herbert. Found under John Herbert in other indexes, but Herbert in the new GRO one. So be aware, the new GRO index will show the name the baby was originally registered under. This may cause confusion, especially for one-namers. Overall though, despite its clumsiness and limitations in some ways, I’m really happy with the additional options it provides. So a thumbs up from me. Update 1: Just read on the “Who Do You Think You Are?” Magazine FB page that, following on from these indexes, the GRO will trial the purchase of uncertified PDFs of birth certificates from 1837-1934 and death certificates from 1837-1957 at a cost of £6 each. This from 9 November 2016 lasting for three weeks, or until 45,000 PDFs have been purchased. “From 9 November, we are trialling emailing PDF copies of registration records. Records will not be immediately viewable, but emailed as a PDF. Full details are in here in the GRO’s “Most Customers Want to Know” page. I’ve ordered a couple of PDF certificates under the new system, which is all very straightforward to use. In fact it’s more user-friendly for those indexed entries, as you can place your order direct from the search result and all the relevant information (including name, District, Quarter, Volume & Page) is automatically entered. Delivery for these Phase 1 PDF’s is to a slightly longer timeframe. My expected email delivery is 16 November. I’m just hoping the 45,000 limit isn’t reached before they arrive, as if I’ve correctly identified a birth for an hitherto unknown baby of my 2x great grandparents, I also want to get the death certificate. Update 3: Phase 1 ended on 30 November. I ended up ordering 19 PDFs in total. Six have arrived, although I do have an issue with one. It arrived in an unopenable Winmail.dat format on 11 November. The GRO finally re-sent it as a PDF on 2 December. I ordered the final 13 towards the end of the trial and delivery, due to the volume of orders, is not anticipated until early December. Update 4: Pilot phase 2, for a within three hour delivery service for PDF copies of all birth, death, marriage and civil partnership records has ended now. However the £45 price tag was beyond my purse strings. These PDFs will cost £8. I may be tempted here, though it is only a £1.25 saving on the postal service – so not a massive saving. 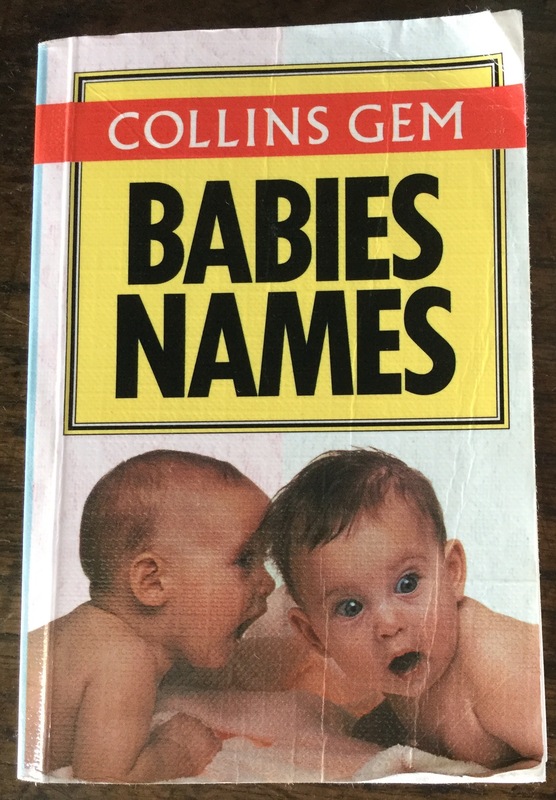 I remember well my husband and I spending hours pouring over a book of baby names throughout my pregnancy trying to decide on boy/girl options for the impending arrival of our little bundle of joy. OK, not so much him as me. We were sure of our choices for a boy – William Patrick. Less so for a girl. Alice was the early favourite, although we were not entirely convinced. That was until our daughter arrived and within minutes we did a sudden about-turn to Amelia Grace. This was way before Amelia featured in the annual top 10 lists of baby names produced, so we were not swayed (or should that be put off?) by popular opinion. Then it was down to the Registry Office to make her official, like generations of parents before. But it’s not always that straightforward. What happens if you change your mind after the official form filling? If you decide after all it wasn’t the right choice? Perhaps the parent doing the registering put down the wrong name, or an “unagreed” one. In my recent family history I’ve a couple of examples, with unofficial solutions. My grandma registered my dad’s birth. He has a Christian and middle name. Seemingly the Christian name was my grandma’s choice – her dad’s name, Patrick. My grandad wasn’t best pleased when he found out after the deed was done. As a compromise my dad has always gone by his middle name. Something that causes endless confusion when dealing with officialdom, the only time when he’s ever referred to as Patrick. But at least we know about it so it’s not an issue – though it might be for future family historians, seeking him under his every-day name! And there was a bit of pay-back for my grandma’s trickery. 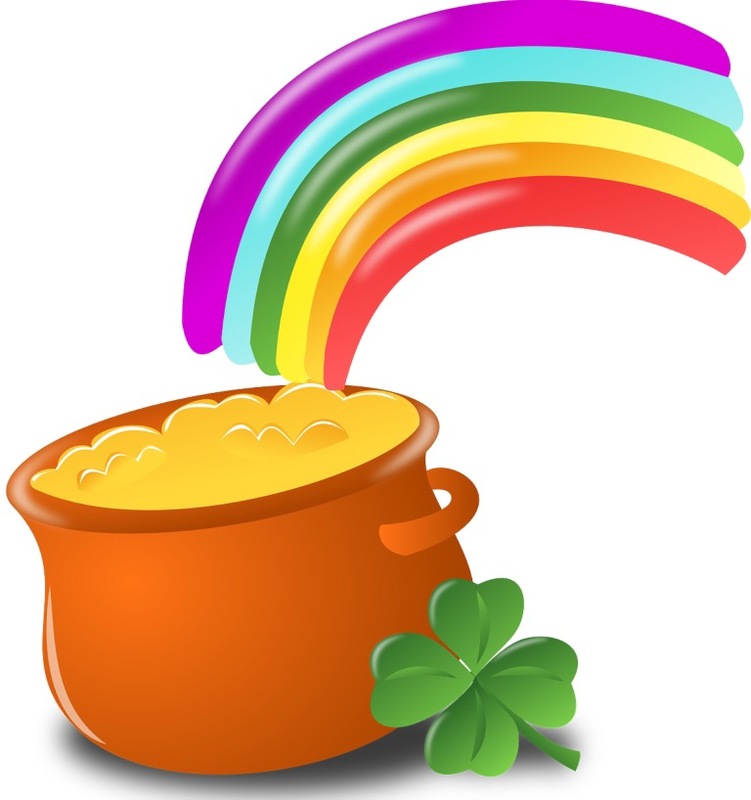 Her next son was born on St Patrick’s day – but she’d already used the name! I also have a maternal aunt. Looking for her in the GRO indexes is problematical. My grandpa registered her under the wrong name, apparently the name of a former girlfriend. Imagine explaining that one away. Unsurprisingly she’s never used that name, although it is remarkably similar to the one she goes by . Mind you my grandpa has a tendency to mess up birth registration. To be honest I’m surprised my nana let him do it again after the example of my aunt. But she did. The result is my mum’s birth is registered on the wrong day – something she didn’t discover till getting a copy of her certificate when leaving school, much to her embarrassment. Now, like the queen, she has two birthdays. She chooses, from year to year, which is the most convenient date to celebrate. I suppose it’s sometimes all too easy to forget when researching your family tree that these are not one-dimensional, generational paper-trail figures. They were real people, with emotions and feelings and lives just as rich, rounded and complex as ours today. So although I shouldn’t have been, it was somewhat of a shock to find even earlier examples when I delved into my family tree and bought those all-important birth certificates. But these were examples where the families concerned actually did something about it through official channels. Permissible but unusual, you could change to the name registered for a child providing it was done within 12 months. There is a column on the birth certificate indicating “name entered after registration” catering for this eventuality. 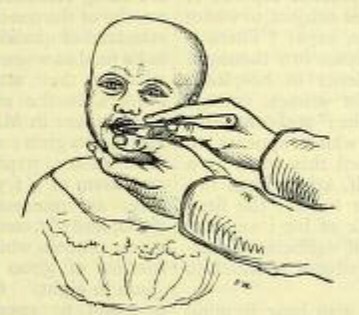 Normal procedure was that the Minister performing the baptism provided a certificate confirming the child’s baptismal name; if unbaptised, the mother or father signed a certificate. This had to be taken to the registrar or superintendant registrar and a fee paid. So not a light undertaking given the financial and time implications, not to say knowledge in the first place that this was an option. I’ve discovered two examples in my direct line ancestry. The first is for my 2x great grandmother Kezia(h) Clough. Born in Drighlington on 21 October 1850 she was the 6th, and youngest, daughter of William and Mary Clough (née Burnett). On 12 November 1850 Mary registered the baby’s birth, signing with her mark. Her daughter’s registered name was Emma. However, there is an entry in the name-change column. In this case it indicates the alteration to Kesia (another variation). No date as to when the amendment took place. The baptismal register at St Peter’s, Birstall, shows the child was baptised with the name Kezia on 29 December 1850. So the decision was made relatively quickly. I’ve no idea why the change of heart. Mary did have a sister named Keziah who died in 1837. But that was over 13 years before the birth of Emma/Kezia, and Mary had two other daughters born after her sister’s death. So ample opportunity to name a daughter after her sister, without an after-registration moment of enlightenment. The reason will forever be a mystery. You might have observed that I’ve alluded to the fact there are variant spellings of Kezia on official documents. Sometimes the alternative Keziah is used. Something else to consider in that elusive ancestor hunt. The other example is my great grandad Jack Hill. Coincidentally he is the son of Kezia and her husband Joseph Hill. Jack was their third son. Born on on 10 December 1872, Joseph registered him on 13 December, under the name Herbert. The amendment column shows a post-registration change of name to John Herbert. Again nothing to indicate when the change was made. Some months after birth, on 25 May 1873, he was baptised John Herbert at Birstall St Peter’s. So another bit of naming confusion thrown into the ancestral search mix – the diminutive: Jack being a diminutive of John. Once more no clues as to why the change. Perhaps it was an afterthought nod towards Kezia’s brother John, who died in 1871. Or, the theory I’m leaning towards, is Herbert’s name was too close to the name of his older brother Albert (Bert & Bert), something hinted at in that May baptismal entry where “John Albert” is scored out and replaced by “John Herbert“. Names being used for no obvious reason at all, other than to frustrate family history researchers. For example Cissie used instead of the registered name of Sabina (yes, that’s one of mine too). Extract from GRO birth register entry for Kesia (Emma) Clough: Image © Crown Copyright and posted in compliance with General Register Office copyright guidance.